The Winter Leagues concluded in Stromness last Sunday afternoon (19th April). A number of weather related cancellations have seen the season extended but the cold wind blowing across the All Weather Pitch provided a wintry feel to a dry Spring day. 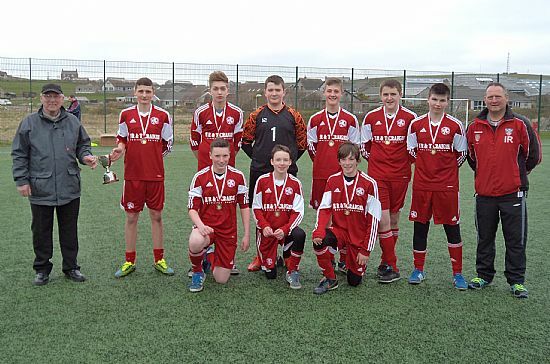 With East United having already clinched the S3/S4 Winter League the main focus was on the S1/S2 League where East Utd A and Stromness remained undefeated and faced each other in a winner takes all match. In a fiercely competitive match East enjoyed the bulk of possession and created the better chances but were unable to penetrate the Stromness defence. With Stromness holding out for a goalless draw they were able to retain the league title on goal difference to narrowly edge out United. East United completed the S3/S4 league with a narrow 1-0 victory over Thorfinn to maintain their unbeaten record and deservedly win the league. This is the third year in a row United have won the league. At the end of the matches Stephen Crawford OYDG Chairman congratulated all the teams and coaches who had put up with some difficult weather conditions and a spate of weather related cancellations over the winter months. He thanked both sponsors – Jim Cormack and N&D Chalmers as well as the clubs for refereeing the matches. The day concluded with the presentation of the silverware with Norrie Chalmers presenting the N&D Chalmers Cup and winners medals to Stromness and Jim Cormack presenting his cup and winners medals to East United. Finally this year the Winter League were run as part of the Bank of Scotland national Midnight League initiative run in partnership between the Scottish FA, Bank of Scotland and Cashback for Communities. OYDG would like to thank all the partners for supporting what has been an enjoyable competition. East Utd A 6 East Utd B 0; Stromness 5 Thorfinn A 0; East Utd B 1 Stromness 4; Thorfinn B 1 Thorfinn A 4; Stromness 0 East Utd A 0; East Utd B 0 Thorfinn B 1. Stromness B 0 Dounby 1; Thorfinn A 0 East Utd 1; Stromness B 0 Thorfinn A 0; Stromness B 0 Stromness A 3. East Utd B 0 Thorfinn A 2; Stromness 0 East Utd A 0; Thorfinn B 0 Stromness 3; East Utd A 1 Thorfinn A 0; Stromness 7 Thorfinn B 0. Stromness A 0 East Utd 0; Thorfinn A 1 Dounby 0; East Utd 2 Thorfinn A 0; Dounby 0 Stromness A 0; Thorfinn A 1 Stromness A 2. The Winter 7-a-side Leagues resumed on Sunday in Stromness after several weather related cancellations. The S1/2 competition saw East Utd A put in a strong performance with wins against both Thorfinn A and Thorfinn B, the match against Thorfinn A being a particularly closely fought affair. 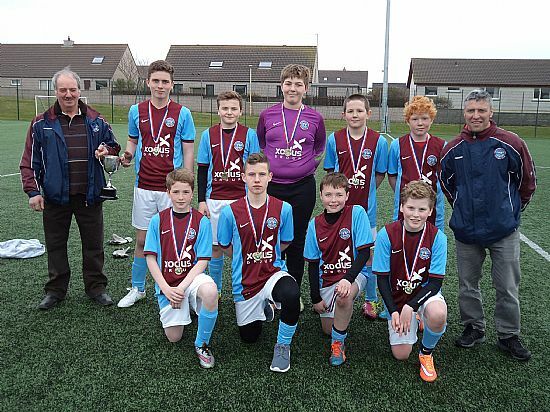 In the S3/4 competition East Utd played very well to win all three of their games, the winner of their final game against Stromness A coming in the dying seconds of the game, for a 2-1 win. Dounby, Stromness A and Stromness B shared the points in each of their matches with each other. East Utd A 1 Thorfinn A 0; East Utd B 0 Thorfinn A 1; Thorfinn B 0 East Utd A 2; East Utd B 4 Thorfinn B 0. Stromness B 0 Stromness A 0, East Utd 1 Stromness B 0; Dounby 0 Stromness A 0; East Utd 2 Dounby 0; Stromness B 1 Dounby 1, Stromness A 1 East Utd 2. Thorfinn B 0 Thorfinn A 4; East Utd A 5 East Utd B 0; Thorfinn B 0 East Utd A 2; Stromness 1 Thorfinn A 0; East Utd B 1 Stromness 2. Stromness A 2 Thorfinn B 0; Stromness B 0 East Utd 1; Dounby 0 East Utd 0; Stromness B 0 Thorfinn A 1; Stromness A 0 Thorfinn A 0; Dounby 2 Thorfinn B 0; Dounby 1 Thorfinn A 2. Update - The Winter League fixtures postponed on Sunday 14th December will now be played on Sunday 1st March in Stromness. The first week of the 2014/15 7-a-side Winter Leagues will be played this Sunday afternoon 14th December at the Stromness All Weather Pitch. Six teams are competing in the S3/S4 league and 5 in the S1/S2 league. The competition will be played over 4 weeks with fixtures planned for 22nd February in Stromness and 25 January and 15 March in Kirkwall. Details of all the fixtures available HERE. Clubs are reminded that each team will have a maximum of 10 players on the night and that substitutions can take place on a rolling basis. Since it is winter, players, coaches, and spectators are reminded to come with adequate clothing.